Side-by-side of the original strip 1 and a recreation. It was recently put across to me that Chapter One of The SuperFogeys, “Insane Romance From Hell,” is the number one barrier SF has for attracting new readers. I didn’t disagree. This same person told me that, in their opinion, SuperFogeys is easily as good if not better than anything DC or Marvel are putting out these days. High praise, but why the disconnect? If SF is that good, then why is Chapter One so bad? If you’ve read the chapter, of course you know. Chapter One plays out the way you think a comic strip about old superheroes in a nursing home would: gag-a-day, old people jokes, stiff characters, parody and bad-to-barely-acceptable art. It has its charms. I still think strip 12 is one of the best jokes I’ve ever done. 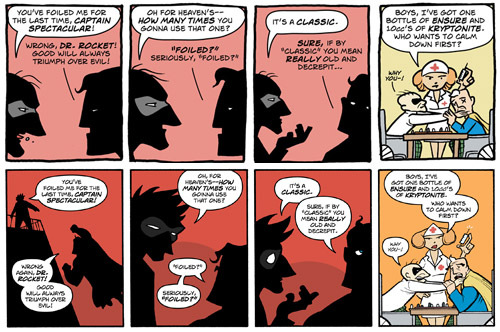 The last strip is essential to the overall SF mythology. But the rest? Doesn’t feel–or look–like what SuperFogeys very quickly turned into. Compare Chapters 1 and 2. Big difference. I wish I could go back. I’d love to redo Chapter One, make it shorter and more concise and… pretty. I’d probably take the Operation: Valhalla story and the Third Man’s introduction and incorporate it. I’d probably make it a proper introduction to the world of Valhalla and include a lot more background characters. I’d make the whole kidnapping business with Spy Gal much shorter and less complicated. I’d make Dr. Rocket a bit less of a dirty old man. I’d set up the mystery and the dynamics between the characters and get out. And I’d make it look GOOD. A real enticement for what follows. Who knows? Maybe one day it will be worth doing. I’m loathe to change history, but I think it’s true–new readers who check out Chapter One do not really learn the first thing about what SuperFogeys really is. Would anyone call SF a parody anymore? Probably not. I dunno. I wish I knew the solution here. Is there a chapter that’s better to jump in on? 4? 7? Maybe the upcoming 13. I could see that. What do you think? Is Chapter One that bad? I think most projects have that problem. Has anyone ever gone back and really looked at the old stories of a lot of famous supers? Batman used a gun and killed villain, apparently. No matter how well one plans something, it almost always needs a bit of editing that doesn’t become apparent until later. What I would suggest — and it’s something I’ve been meaning to do myself — is simply script a new introduction to the comic. “Charby the Vampirate” did it quite well (and basically put a warning sign up of “Horrible artwork and writing ahead”) and I think it’d work for Super Fogeys too. It’d be less work than a massive retcon, and people should be more than willing to look past the early days once they understand where it’s all going. That’s a solid idea–and one I hadn’t thought of. It just might be worth doing. Thanks for that, Scott. I’m all for the old, but you never know when you can attract new readers. Maybe eventually do a new version but keep the old as a special feature somewhere on the site? Personally I’d love to see chapter one reworked in the style it is now. I’d never completely erase the old version of Chapter One. Even if I did make a new one. It’s part of history and part of the story. Even if I did a new one, I’d probably be inclined to do it in such a way that it didn’t contradict the existing Chapter One so they could live side-by-side. This might sound weird, but I’m one of those strange people who actually was attracted to SF BECAUSE of chapter 1. Yeah, I know, bad taste, right? lol. But, seriously. I actually miss the tone and charm of the earlier chapters. What SF has become is something much grander – but yet not what I like. Not what I wished it was. I look at the earlier chapters, especially chapter one, and say, “Hey. It was good while it lasted. It was hilarious! Things were simple back then too. You knew who the bad guys were and who the good guys were and ya laughed. Ya laughed like Matt Damon on pain killers. But it is what it is and there’s no looking back. Progress. Can’t stay in the same place forever.” Anyway, what I mean is that SuperFogeys is no longer the comic I came to love. It’s an entirely new beast. But that new beast is good too and I remain a loyal reader. Your characters have honestly been THE only I’ve ever been emotionally invested in, ever. Okay, maybe another, but not sure that’s true. I keep reading to see what will happen. In the beginning I loved the humor. But then, like a good horror movie or drama or etc, the roller coaster reached the top and we all flew down to kiss the ground until we were snatched back up and climbed all the way to the top again. The first few chapters were only the anticipation – the building up to the climax of what SuperFogeys was turning into. I’ve startled rambling and gotten distracted and no longer know what I’m trying to say, but I think it’s that I actually liked the earlier chapters more. It didn’t make me keep coming back like it does now (although the current chapter was so long without much really happening that I got bored with it, honestly), but I liked it too. After Jerry was exposed as Klein as ThirdMan that’s when things really changed, I thought. When I started noticing it was turning into a different beast, if you will. Maybe not. Maybe I imagined that. But before then I loved the comic as a humor strip and I started becoming invested in the characters when Dr. Rocket (ala fake) passed on. The origin story at the funeral was a wonderful read and I loved it very much. I consider that to be the highest point of the “Classic SuperFogeys” era (yes, you have eras now). I feel like the earlier SuperFogeys is kind of like Batman in the the 70′s and then there was a change and it started becoming the Batman of the 80′s and 90′s with all that darker less comedic Frank Miller and Tim Burton/Micheal Keaton, etc, and Animated Series stuff, culminating, as SuperFogeys will, into Batman Begins and Dark Knight or … whatever. Admittedly, although the Adam West Batman is … classic? Humorous? Fun? I much more prefer the Animated Series Batman or … almost any more serious, darker take on the character. Problem is though that Batman has been ret-conned and re-imagined and everything with all new introductory stories for readers. SuperFogeys doesn’t have that. The Adam West days are within canon and the later Tim Burton and Batman Begins are all a continuous canon, building one upon the other, creating … well, for Batman, something I reject like a bad organ donation, but for SuperFogeys not that horrible. But, yeah, a redone Chapter One might not be such a bad idea. I really love the original Chapter One, however, and would hope it to still be available and in print somewhere. But if you think it would help new readers – you and Marc go for it! But when should that be done? I’m thinking after SuperFogeys main story about Jerry comes to an end (you said you are not sure if you will continue the story past that, I believe). I say that in order to keep the story going (and not kill Marc and his drawing hand), but the one problem about that is: if the story is over, are you still able to draw new readers in? Guess so. Seems weird in my head somehow for a webcomic after it’s conclusion. Could be done. Nothing weird about new readership with a book. Maybe one of those monthly subscription comics could be compared to this if it just ended. Anyway, I leave the decision making to you. Just wanted to let you know that I loved the first few chapters of the Fogeys. Just think. If you didn’t make it that way, we might never have Space Pig or jokes about Cap being pantless! And, although inappropriate and rude and crude, Dr. Rocket’s … dirtiness somehow forms the character in my head. I actually like the contrast between fake Rocket and real Rocket too. Real Rocket is the way he is because the path that he took, as opposed to the one taken by the fake Rocket, lead to his realization that the Jorbons were the enemy and Cap wasn’t, lots and lots of intergalactic bloodshed, and cancer. That’s why real Rocket is … not like the fake. How to put it? The fake wasn’t anywhere near as …depressed?… and calm and reflective. Seriously, the real Rocket doesn’t smile like the fake. You noticed? Not much smiling. Not much taunting the Captain. No playing chess/checkers. The real is much moodier. The first chapter’s running gag about Rocket having a thing for Spy Gal was hilarious and gave Cap (and Jerry?) conflict, causing him to take action of some kind. “A hero cannot exist within a vacuum.” But I’m going to stop typing now. I’m tired and getting way off topic and rambling on forever. I will say this though: I’ve noticed in past chapters that the Captain has risen to the challenge. He isn’t about to let Spy Gal and Dr. Rocket have a thing. He finally starts wearing pants again. He punches Gene in the face. He asks Spy Gal to marry him. He overcomes his feelings toward Dr. Rocket and works at regaining their friendship. He does fail, I admit, at both manning up and stopping Tangerine from murdering the fake Rocket and, although Cap punched Gene (who he did not see as a friend as he did Tangerine) for how he constantly made fun of Spy Gal, he did not even have words with Tangerine concerning his knocking Spy Gal unconscious. When his son “died” many thought he was wrong not to take action, but he showed a strength and maturity in not taking revenge that not even Spy Gal could understand. And there’s probably examples I’ve missed. My complain is: what happened? And will we be told? Seriously. Even if it is due to depression for losing his son or some of the theories tossed around in the comments – like the infamous theory that he doesn’t believe he deserves to be called a hero – or even gambling addiction, it needs to be explained. To me – to me – the entire current chapter (12, right?) set in Las Vegas has been extremely unfaithful to the Captain’s character. I don’t understand what happened between chapter 11 and 12 or if it had been happening for a few chapters or not, but his behavior in chapter 12 REALLY needs to be explained in comic at some point. And I’m sure you got that planned. But just wanted to let you know. I know I’ve mentioned this complaint in the past as well. Hoo-boy. Will, that’s a lot to take in. I think the gist of what you’re saying is that while you care more about the characters now, you prefer the more comical early days overall. What that tells me is that you might be a little too steeped in nostalgia. I’ll take greater investment over greater amusement any day. As for your comments about Captain Spectacular… I think you’ll find plenty of people willing to disagree with you that he’s been inconsistently portrayed, but I’ll leave it to them to offer a rebuttal. Not my place, I think. You could be right and you could be wrong. Either way, thanks for all the thoughts. Your dedication to SF never fails to impress and humble me. Ha ha, sorry. my mind is a dangerous place when I type/think when super tired. Right. It is nostalgia. I’m not saying that the earlier SuperFogeys is superior, just something I enjoyed and that what we have today is, although I still enjoy it, much different. Creating an alternate version of Chapter One, or even other chapters, isn’t such a bad idea. Be great to have the original version of the chapters available for nostalgia and historical purposes, etc. Could be amusing to look at the original from time to time. I’m with Antoine Gagnon as I enjoyed the evolution of the comic to what it is today. I was trying to say before that we can’t stay in suspended animation in the past. There has to be progress. Whereas I’m sad the days of Star Maiden being loopy, for example, are over, there must be progress. We could keep on that forever until the jokes ran dry, but why? There needs to be progress. I feel that Cap is inconsistent, but I need to re-read through the entire series to really see whether that’s true or not. And that’s something I no longer have time to do in my life. Right now, at least, and probably for some time to come. Whether inconsistent or not, I’d like to know why he “blew it” at the slots. And what, if anything, he’s going to do about it. Also, he’s “lost everything.” Will he piece the puzzle together? And those are questions I think your strip will answer when the time is right, so I’m not too worried about it. For example, I hear you’ve written Cap’s reaction to it recently (read a comment of yours in another place about it). Well, I did start reading Superfogeys recently, it was on my “Comics to read” list and put it on top of the list after I met Marc at NYCC back in October. I actually really enjoyed the first chapter, and going through the archives and the Friday stories as well. I didn’t only enjoy the story and the characters, I also enjoyed the evolution of the comic as an whole (both drawing & Script). I was raised reading the french comic classics like Tintin & Astérix. If you look at the first albums, you may say “eeeesh! This is ugly”. But it’s perfectly fine, because it is evolution and this improvement overtime is part of the comic. Honestly, I’m not sure I would keep reading a comic that has been looking the same for the past 1-15 years. I need that evolution, i need that change. Example: UserFriendly.org: I used to read that comic back in 1999-2000. I stopped because the comic never really evolved at all. Same look, same crappy art, same weird looking website. No changes at all. Antoine, that’s really encouraging. I hope other people can give SF the same chance. Certainly when a person first comes to the site, they see the newest stuff first and that should give some clue to how things develop and progress. I’m with you on the enjoyment of seeing comics evolve. I too once followed comics that stagnated. They’re still good comics, but if the creator isn’t interested enough to grow and change, then I lose interest as well. As I’m sure everyone has noticed, Marc is continuing the SF evolution in fine style. He’s done nearly 100 strips at this point and going back to strip 301 and seeing how he started is a real treat. Marc’s the real deal. Hopefully my ability to write this thing is also increasing and matching him along the way. Chapter 1 eased me into SuperFogeys, you might say. I loved the concept of retired superheroes in a nursing home, so when I started reading at the beginning, it was the simplicity and gag-a-day format that drew me into the comic. From there, it improved, got more engaging, and pulled me in to the point that I have had to keep reading ever since. I think the way this comic begins is just right. Sure, it’s more comic book style drama and action nowadays than it was at the beginning (with greater dynamics), but chances are if I wasn’t eased into the comic the way Chapter 1 did for me, I might not have grown with the story the way I did. That first chapter is definitely what drew me in. ‘Nuff said. Brock, what Jeremy said is exactly how I feel – except he was able to say it more clearly and in less amount of words. One of the great things to me about reading comics on the web is that you get to see major changes like this in real-time. First, the effect of “speeding up” your perception of a feature’s development works similarly to reading through a decade of print-comics anthologies. And secondly, the particulars of “web” comics production works in the same direction. A “web” cartoonist often feels freer to make stylistic changes, and even if things remain gradual, the perception of development (as viewed through an archive) is often accelerated just by virtue of a thrice-weekly update schedule (for example) as opposed to a daily. In other words, the same chronological amount of artistic progression in fewer installments. So I feel like the first chapter still represents the series pretty well, even though it doesn’t resemble the rest of it. It sets up a gag-a-day premise for a while that really lets you get the character identities pretty clearly without having much to keep up with, then develops into a story you want to read, then as that progresses it builds up the characters even more. That kind of progression is, to me, a really great part of reading comics online, even if some of the reason for the way things were early on seems (in hindsight) to be a lack of proper development.